Amazon is bringing John Clancy's Jack Ryan to television. So far many movie adaptations were released, with amongst others Alec Baldwin portraying Ryan, but now John Krasinski is portraying one of the most famous fictional CIA officers of all time. Where can you stream Tom Clancy’s Jack Ryan? On 2018-08-30 Action & Adventure/Drama TV Series Tom Clancy’s Jack Ryan first aired on Amazon. 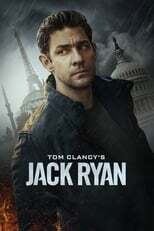 Written and created by Graham Roland & Carlton Cuse, and produced by Paramount Television & Amazon Studios, Tom Clancy’s Jack Ryan will return and was last broadcasted on 2018-08-30.